I'm always working, and always creating things for my games, but the last week had me exploring a class that I've always enjoyed creating in whatever D&D game I am playing. Classic D&D and AD&D 1e, really didn't have a Necromancer "class", There MAY have been something in a dragon magazine during the time frame of an NPC class, or something, but most of the DMs I played with did not allow the use of dragon magazine material at all. So I had to piece together a class, using Magic-User and focusing on certain spells, giving him a certain way to dress and working with the DM to create and then find/make certain items that would mimic (what I thought) a Necromancer class should look like. Those characters failed, either with horrible deaths, due to lack of options (mostly me refusing to use things with the Magic User class) or it just didn't work out. Later editions we see the Necromancer class become an optional class, to a core class now. But that doesn't solve the issue of Mazes & Perils, but thanks to a player sparking my mind and wanting to play said class, it made me open a bunch of old boxes and pull out some of those notebooks where I attempted to write up a Necromancer class. The class is a hybrid class, part Magic-User and part Cleric, taking a little bit of each to determine how the class works. So far I am about 50% done with the class, I have the level chart done, this class goes up to level 16, with spells that go to level 6. This by far will be the highest leveling class for M&P and a new level of spells to reach! (and yes this does mean the core classes and optional classes will get an overhaul and more levels too). This is just a working list, this could decrease or increase, of course the Necromancer gets access to Magic-User spells as well. 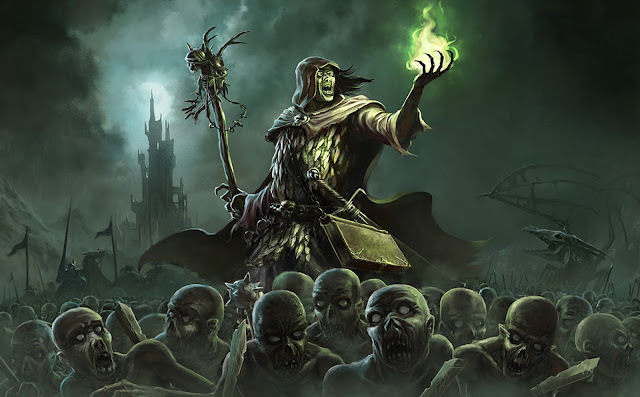 I've decided that a Necromancer can be any alignment as long as its not "good" based and based on alignment, the Necromancer will receive spells off a certain list. As it gets closer to releasing it, I will play test it, so if anyone is interested in doing that, we can certainly arrange that to happen! Mazes & Perils Wisdom Chart and New Mechanic? Black Pudding Issue #2 now in print!